Dry skin can be a blessing but more often it is troublesome. Those with dry skin generally need not worry about blemishes except for the occasional stray that appears from hormonal changes or stress. But dry skin looks dull and flaky. And worse, it can emphasize the appearance of fine lines and wrinkles. Age and the environment are two factors that contribute to this skin type. Over time, the sebaceous glands within the dermis layer slow their production of sebum, the body’s natural moisturizer. The skin’s ability to retain moisture also lessens as we grow older. This is caused by the breakdown of the intracellular matrix, the collagen and elastin layer that helps hold skin tissue together. When this layer begins to break apart, it becomes more difficult for skin to hold in moisture. 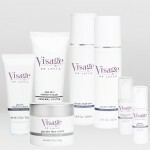 As moisture escapes, skin becomes drier. Other causes of dry skin include climates that are arid, windy and dry. Use of harsh soaps and detergents and too much unprotected exposure to the sun’s damaging rays can also negatively influence skin. Genetics plays a role as well. How do I know I have dry skin? First consider where you live. Windy areas and areas with low humidity cause dryness by stripping skin of its natural oils. Living in areas where winters are cold causes skin trouble as well. Even if you don’t spend much time outdoors, interior heaters as well as air conditioning units in hot, dry climates can sap the air of moisture and cause dry skin. Visible indicators of dry skin include skin that flakes easily. Plus, dry skin often looks tight and taut because pore openings are very tiny. 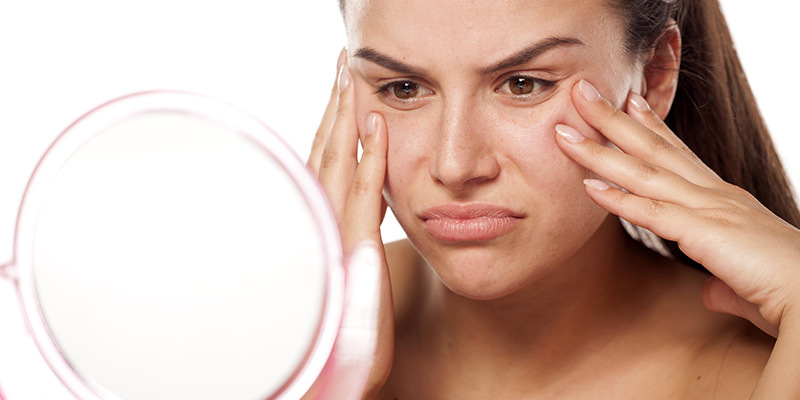 If you don’t yet see these tell-tale signs of dry skin but you’re at or approaching mid-life, it’s time to start looking. If you have dry skin, proper care involves retaining as much moisture as possible. One way is to avoid using products containing alcohol because alcohol dries. Recommended ingredients for dry skin include alpha hydroxy, lactic acids, petroleum, lanolin and glycerin so take time to read product labels. Dry skin won’t always feel like it needs to be cleansed, but it does, twice daily, morning and night. Using a gentle cleanser made especially for skin that’s dry, cleanse using warm, not hot water. Finish off with a cool rinse. It’s never a good idea to use hot water to clean any type of skin or to soak in a tub because doing so will only strip skin of its natural oils. After washing your skin, pat it dry using a soft towel. Then apply a light moisturizer. Those containing Vitamin E are excellent choices. If you wear make-up, choose foundations that contain the moisturizing ingredients mentioned above. Help keep skin hydrated by drinking water and increasing your consumption of high-water content foods such as cucumbers and watermelon. Most fruits and vegetables are excellent hydrating foods plus they’re excellent sources of important vitamins, minerals, fiber and antioxidants. Antioxidants are crucial in helping maintain the skin’s intracellular matrix.